Lisa is a 23 year-old ranch foreman. She has a rough, physical job. Three months before she came to see me she was thrown from a horse and landed on her right hand. She had severe pain and swelling at her wrist. But being tough as she is, she continued her work, roping cattle, and caring for horses and livestock. All this put ongoing stress on the injuries in the wrist. This led to continued pain and very restricted range of motion. Finally Lisa had so much pain and restriction that she sought medical attention with an orthopedic surgeon. He did imaging studies and told her that in addition to a navicular fracture, she had “disrupted the major ligaments of her wrist and needed surgery right away.” She was further told that the surgery would decrease the range of motion further (which was less than 10 degrees at that time). Lastly, the surgeon told her that if she didn’t have the surgery right away that eventually “the wrist would collapse and the arm bones would protrude through the wrist” and she would be unable to fix it then. She sought my attention in an attempt to avoid the surgery and in the hopes of regaining her range of motion. After examination, I identified her injured ligaments and scaphoid bone fracture as the source of her pain. She was treated aggressively with Prolotherapy using strong solutions targeting the injured ligaments. She received three treatments by me, one week apart. These were followed by three more treatments, six to eight weeks apart, in her home state, by another practitioner. I saw Lisa recently (two to three months after her last treatment), and she reported no pain and full range of motion of her wrist! She had no tenderness over the scaphoid. She is back at full duty on the ranch and is a very happy cowgirl! Hands and wrists are amazing feats of engineering and design. Twenty-seven bones, a sea of ligaments, tendons, joints and muscles work together to make an “instrument” that can type 150 wpm, serve a tennis ball at 138 mph, and yet, feel the gentle touch of your romantic partner’s hand. With all this complexity it is not surprising that chronic injuries can and do occur. I will review how to avoid unnecessary cortisone shots, surgery and disability by treating injuries of the wrist and hand with Prolotherapy! The carpal bones of the wrist consist of eight bones in two rows with 27 articular surfaces. These are held together with a “sea” of ligaments bridging the articulations giving stability to the wrist. (See Figure 1.) We can have a variety of injuries at the wrist and I will look at them separately. Figure 1. The wrist is comprised of 15 bones, 27 articular surfaces, and a host of ligaments to hold it all together. Used with permission of Beulah Land Press © 2001 Oak Park, IL. Prolo Your Sports Injuries Away!, fig. 22-10. This often presents as “snuff box” tenderness and radial wrist pain. Navicular fracture comprises about 70% of all carpal fractures and roughly one in 10 of these results in avascular necrosis. As physicians, we all know the challenge of diagnosing navicular fracture, especially early. When a person has pain over the navicular bone, while one must consider fracture, a more common cause of navicular pain is injury to the ligaments that surround it. While immobilization should be considered if a fracture is present, as the previous case study shows, aggressive Prolotherapy treatment all around the navicular with strong solution stimulates blood supply, local immune activity, and of course, regeneration of stabilizing ligaments and tendons. If the pain is from the surrounding ligaments and tendons, then a successful outcome is highly likely. The patient is positioned comfortably allowing the hand to be alternately pronated and supinated. The skin is cleansed, and the local anesthesia is administered over the areas to be treated. A 5cc luer lock syringe is filled with standard prolo solution. The solution may be supplemented with zinc sulfate or sodium morrhuate as needed (0.5 to 1cc). Injections are given onto and immediately around the scaphoid. (See Figure 2.) Care is taken around the volar aspect of the radial wrist to avoid the radial artery and nerve. Four to six treatments, each about four weeks apart, gives excellent results. Attachments at the hook of the hamate can be injured by repetitive pressure as in chiropractic compression with the heel of the hand. The injury can be palpated just distal to the volar ulna. Three careful 0.5cc injections to the hook of the hamate from various angles resolves this well in four to six treatments. The skin is cleansed and local anesthesia is administered. A 10cc luer lock syringe is filled with standard prolo solution and a 25G 1 to 2-inch needle is attached. (The length is not critical, we will only be using the distal 0.25 inch). Injections are given in two or three rows along the dorsal wrist, peppering the injured areas from the radial side to the ulnar side. (See Figure 3). Figure 3. Dorsal wrist injection. Ganglion cysts respond well to Prolotherapy. The cyst is a dorsal protrusion of the joint capsule containing synovial fluid. If the cyst is merely aspirated or surgically resected it will routinely recur. If, on the other hand, we follow up the aspiration of the cyst with Prolotherapy to the painful wrist dorsally, the underlying cause is stimulated to heal. After a completed series of Prolotherapy treatments the problem does not return. ** CTRAC is available at www.ctracforcts.com. The ulnar collateral ligament of the wrist runs from the distal ulna to the proximal carpal bone and beyond to the proximal fifth metacarpal. When injured, there is pain with radial deviation of the wrist and with pressure on the ulnar wrist. 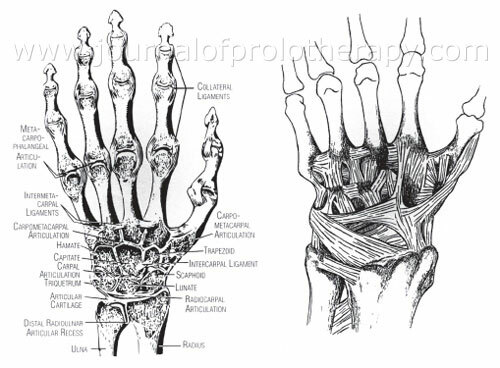 Similarly, the radial collateral ligament runs from the radial styloid distally to the proximal carpal bone and to the proximal first metacarpal. When injured, the pain is elicited by ulnar deviation and direct pressure over the radial wrist. A. Peppering is a technique where an area is peppered with injections of 0.5cc of solution. The technique is begun with an injection of 0.5cc into the injured structure then the needle is partially withdrawn and redirected slightly and reinserted around the injured area and another 0.5cc are injected there. This is repeated multiple times thus “peppering” the fibro-osseous insertion of the tendon or ligament. Figure 4. Radial collateral ligament injection. In my experience, arthritis at the base of the thumb, the metacarpo-trapezio joint, is very common. Injury to this saddle joint is debilitating, eventually limiting almost all opposition of the thumb. There is marked tenderness over the joint line all the way around the joint in advanced cases. And when the joint is isolated manually, there is often pain with even slight movement of the joint. Treatment begins with cleansing the skin and local anesthesia. A 5cc luer lock syringe is filled with standard prolo solution and fitted with a 25G 1 to 2-inch needle. 0.5cc injections are “peppered” along the joint line beginning at the dorsal hand and finishing along the palmar side. (See Figure 5.) The injections on the palmar side are especially painful. Therefore, I save them for last. Figure 5. Metacarp-trapezio joint injection. Metacarpo-phalangeal (MP) and inter-phalangeal (IP) joints are injured in sports and accidents. Prolotherapy effectively stimulates healing in sprains, arthritis, and tendinosis of these joints. The affected joints are identified and cleansed and local anesthesia is applied. A 5cc luer lock syringe is filled with standard Prolotherapy solution and fitted with a 25G 1 to 2-inch needle. The Prolotherapy is administered carefully, injecting 0.5 to 1cc to the radial and ulnar side collateral ligaments and joint capsule of each injured MP and IP joint. (See Figure 6.) The needle does not need to slip into the joint space. The fingers bleed readily after needle puncture and may need light pressure. Figure 6. MP and IP injection. De Quervain’s tenosynovitis is a painful inflammatory condition of the wrist and thumb that often requires a traditional steroid injection treatment, if the area shows classic signs of swelling and calor. If there is clearly no heat or inflammation, then the condition can be presumed to be tendinosis or tendopathy, which typically responds well to Prolotherapy. The thumb abductor (abductor pollicus longus) is identified by having the patient abduct the thumb against light resistance. The tendon tenses and lifts slightly. It can be seen and palpated easily at the radial side of the wrist (it is tender). The skin is cleansed and local anesthesia applied. A 3cc luer lock syringe is filled with 1.5cc of standard Prolotherapy solution and fitted with 25G 1 to 2-inch needle. With a finger palpating the slightly elevated abductor tendon sheath, the needle is passed through the skin and then enters the tendon sheath to inject around the tendon. (See Figure 7.) When the needle is positioned within the sheath, as the injection is administered, it leads to a “sausage-like” swelling of the tendon sheath. This is seen and palpated. One to 1.5cc is injected into the tendon sheath. Figure 7. Wrist abductor pollicis longus tendon Prolotherapy injection. Figure 8. Prolotherapy injection to flexor digitorum tendon. Mallet finger and boutonniere deformity are both effectively treated with Prolotherapy. When the distal extensor tendon is torn the distal inter-phalangeal joint is flexed at 90 degrees and lacks ability to actively extend the distal phalanx. In some cases, a piece of the bony attachment is torn off with the tendon. (See Figure 9.) If we have a similar tear of the extensor tendon at the proximal inter-phalangeal joint we have Boutonniere’s deformity. These injuries are effectively treated with a full extension splint and Prolotherapy to the torn tendon in the fully extended position. Full extension is maintained continuously for six weeks while Prolotherapy is repeated weekly for the first three weeks. The skin is cleansed and anesthetized. A 3cc luer lock syringe is filled with 1cc of standard Prolotherapy solution and fitted with a 25G 1-inch needle. The injection is administered at the extensor tendon tear over or just distal to the dorsal inter-phalangeal joint line. Each of these conditions call for an average of four to six treatments spaced about four to six weeks apart to yield full healing and restoration of function. The hand and wrist are full of many small joints each of which can be injured and cause pain. Thankfully, Prolotherapy can safely and effectively treat each of them. That is why we smile as we Prolo our patient’s hand and wrist pains away! Figure 9. Mallet finger A severe “jammed” finger can actually cause the distal extensor tendon to tear. Splinting is needed, but Prolotherapy can assist healing and decrease healing time for this condition. Used with permission of Beulah Land Press © 2001 Oak Park, IL. Prolo Your Sports Injuries Away!, fig. 22-16.